by D'Army Bailey Author · Nikki Giovanni Author of introduction, etc. When four black college students refused to leave the whites-only lunch counter of a Greensboro, North Carolina, Woolworth's on February 1, 1960, they set off a wave of similar protests among black college students across the South. Memphis native D'Army Bailey, the freshman class president at Southern University — the largest predominantly black college in the nation — soon joined with his classmates in their own battle against segregation in Baton Rouge, Louisiana. 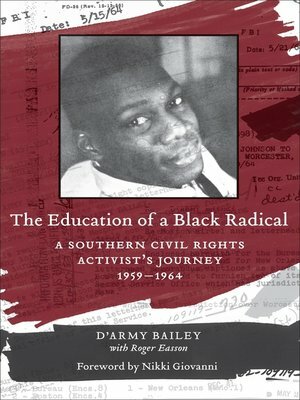 In The Education of a Black Radical, Bailey details his experiences on the front lines of the black student movement of the early 1960s, providing a rare firsthand account of the early days of America's civil rights struggle and a shining example of one man's struggle to uphold the courageous principles of liberty, justice, and equality. A natural leader, Bailey delivered fiery speeches at civil rights rallies, railed against school officials' capitulation to segregation, joined a sit-in at the Greyhound bus station, and picketed against discriminatory hiring practices at numerous Baton Rouge businesses. On December 15, 1961, he marched at the head of two thousand Southern University students seven miles from campus to downtown Baton Rouge to support fellow students jailed for picketing. Baton Rouge police dispersed the peaceful crowd with dogs and tear gas and arrested many participants. After Bailey led a class boycott to protest the administration's efforts to quell the lingering unrest on campus, Southern University summarily expelled him. After his ejection, Bailey continued his academic journey north to Clark University in Worcester, Massachusetts, where liberal white students had established a scholarship for civil rights activists. Bailey sustained and expanded his activism in the North, and he provides invaluable eyewitness accounts of many major events from the civil rights era, including the protests in Washington D.C.'s financial district during the summer of 1963 and the gripping violence and arrests in Baltimore later that year. He sheds new light on the 1963 March on Washington by exploring the political forces that seized the march and changed its direction. Labeled "subversive" and a "black nationalist militant" by the FBI, Bailey crossed paths with many visionary activists. In riveting detail, Bailey recalls several days he spent hosting Malcolm X as a guest speaker at Clark, hanging out with Abbie Hoffman in the early days of the Worsester Student Movement, and personal interactions with other civil rights icons, including the Reverend Will D. Campbell, Anne Braden, James Meredith, Tom Hayden, and future congressmen Barney Frank, John Lewis, and Allard Lowenstein. D'Army Bailey gives voice to a generation of student foot soldiers in the civil rights movement. Moving, powerful, and intensely personal, The Education of a Black Radical offers an inspirational tale of hope and a courageous stand for social change. Moreover, it introduces an invigorating role model for a new generation of activists taking up the racial challenges of the twenty-first century.